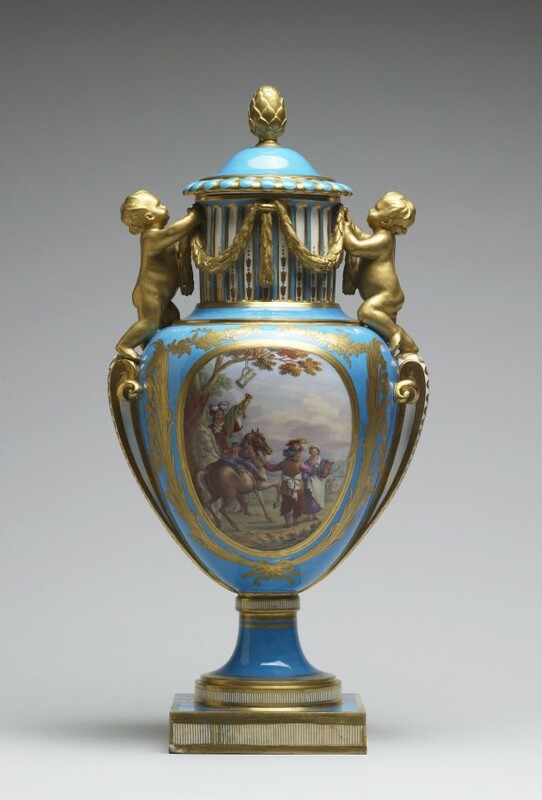 Description This turquoise, or "bleu céleste," oviform vase bears reserves (painted panels on the body of the vase) showing, one one side, a cavalier scene of a trumpeter and peasants by Charles Nicolas Dodin, and, on the other, military trophies. The reserves are surrounded with gilt garlands and laurel leaves. 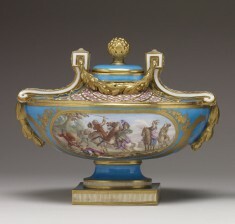 The vase is also adorned with two putti standing on the handles stringing garlands of laurels around the neck. 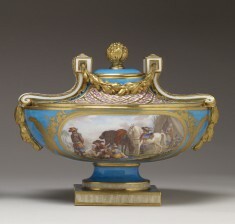 There are similar vases in the Musée du Louvre as well as the Metropolitan Museum of Art in the Kress Collection. It forms part of a garniture (set) with WAM 48.563 and WAM 48.564. Provenance Earl of Pembroke; Earl of Pembroke Collection Sale, May 8, 1851, lot 383; Mrs. Lyne Stephes [date and mode of acquisition unknown]; Baron Schroeder [date and mode of acquisition unknown]; Baron Schroder Sale, Christie's, July 5, 1910, lots 45 and 46; E. M. Hodgkins Collection, Paris, no. 62 [date and mode of acquisition unknown]; A. Seligmann, Rey and Co., New York; Henry Walters, Baltimore, 1928, by purchase; Walters Art Museum, 1931, by bequest.